So you can see what we’re looking at, here is USCHO’s PairWise page (good because you can see the TUC record on this page) and the College Hockey News PairWise page (also nice because of the “customize” button, allowing you to simulate results). First, let’s look near the TUC line. As a refresher, TUCs or Teams Under Consideration, are the teams with RPI’s above .5000. 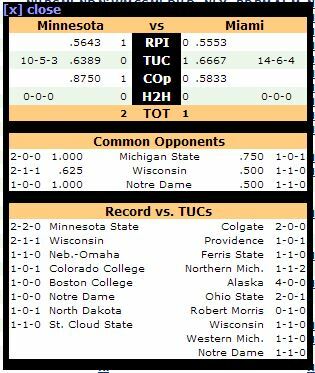 One of the metrics in the PairWise is your record vs. TUCs. As it stands right now, there are 32 TUCs. What Miami fans should be rooting for is Bowling Green (.4937 RPI) or Lake Superior State (.4886) to get a bump. They’ll need a few wins in this last regular season weekend/first playoff weekend to jump into TUC status. Miami has a 14-6-4 record against TUCs to this point.We were watching the Alaska vs Michigan State game very closely last night, and for good reason. With a loss, Alaska dropped all the way out of the PairWise because their RPI would have dropped below .5000. However, they won, and actually moved up to a tie for 17th. They seem to be safe based on their RPI now, which sits at .5063, but they have to keep winning to help Miami. If Alaska drops out of TUC status, the RedHawks lose 4 wins against TUCs which makes our #3 spot more precarious. For now, we’d stay there if Alaska dropped out, but it would make a regional appearance in Toledo or Grand Rapids less likely. Other than that, of Miami’s opponents, Colgate, Ohio State and Northern Michigan are dangerously close to that TUC line. Miami beat Colgate twice in October (remember when?) and is 2-0-1 vs. Ohio State with 2 games to play, and 1-1-2 against Nothern Michigan. Losing those TUC victories over Colgate and OSU would hurt, but losing the Northern Michigan ties/loss could potentially help Miami. Okay, enough TUC talk. Let’s move on to the actual comparisons. Here’s why we think Miami is a STRONG #3 and with a few more wins could be a #1 seed without a doubt. First, the 2 teams behind us: New Hampshire and Boston College. 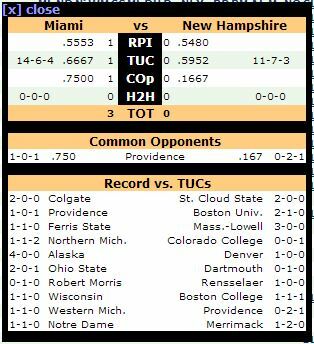 Against the hated Boston College Eagles, currently #5 in the rankings, Miami’s got the RPI advantage as well as TUC advantage. With a 2-comparison lead over BC, let’s say Colgate and OSU drop out of TUC status, thus dropping our TUC record to 10-6-3, a win % of just .5263. We’d then lose the TUC comparison to BC, but still be 1 comparison up on them. Holding strong at #3. There is a scenario out there where BC beats Merrimack tonight, giving them the comparison over UNH. With the same scenario above, BC could then take the comparison over Miami, but it would require them to get a boost in RPI, which at present, they won’t get unless they go on a streak (and probably win) the Hockey East tournament. Switching our focus to New Hampshire, we have a 3-0 lead in the overall comparison. I don’t see a way UNH can jump over us. 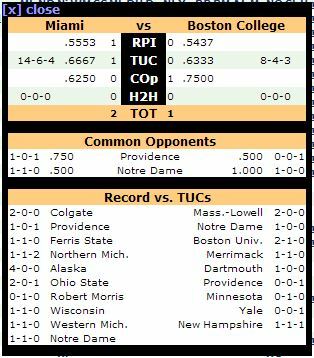 Even if we lose those TUC wins over Colgate and OSU, UNH is 0-2-1 vs our only common opponent (COp) of Providence. With the standings as they are now (UNH/Providence tied for #1 in Hockey East), they’d only play once in the Hockey East Tournament and won’t be able to jump over us in that metric. They’d have to win a bunch, have Miami lose a bunch and take over RPI to get that portion flipped. Not likely to happen if Miami can keep winning. Note: If Miami can win twice over OSU, Ohio State likely drops just below .5000 in RPI, but with Miami’s wins, Miami would actually gain RPI points. Shouldn’t hurt too much. So it’s not very likely that Miami will get passed by either BC or New Hampshire in the PairWise the way we look at it. However, let’s take a look at Minnesota, who currently resides in the #2 spot. Miami’s only metric they lead in is the TUC’s, and RPI isn’t really that close. Minnesota also owns the common opponents metric. The only way this could swap hands is if Minnesota plays Wisconsin twice in the WCHA tournament and loses both. With 4 games left in WCHA play, the current standings would not have them playing each other. Things could change, but Miami isn’t likely to jump over Minnesota in this comparison. Notre Dame sits squarely on the NCAA bubble after splitting the Miami series last weekend, and then earning just 2 ties with Western Michigan this weekend. They are in a tie for 14th right now, which doesn’t guarantee them a spot in the tournament. Shocking, really, considering they were picked to win the CCHA at the beginning of the year by many. Boston University. Let’s not talk about 2010, but rather how they have fallen apart in 2013. Since beating Merrimack 4-1 on January 11, they have gone 2-7-2 and have now dropped to 21st in the PairWise – well out of the tournament. Merrimack has gone 7-1-2 since, and is likely just a win at home over Boston College today (currently playing on CBS Sports Network) from being in the tournament. We’ll keep updating you on Miami’s chances of a #1 seed in Toledo or Grand Rapids as we get new results. For now, things are looking good. Posted on February 24, 2013, in 2012-13 Weekend Recaps, CCHA, Miami RedHawks, NCAA Hockey and tagged college hockey analysis, NCAA Hockey, NCAA Hockey Tournament, PairWise. Bookmark the permalink. Leave a comment.